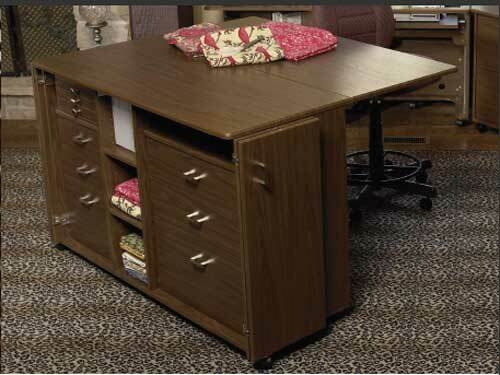 The Cub Plus IV is the perfect addition to a small sewing area, or a spacious suite. Know that whatever size your room is, you won’t have to sacrifice on style! With two versions available, the Cub Plus IV is uniquely adaptable to your room. The Left Cub Plus IV includes a smooth fabric palette, while the Right Cub Plus IV includes a notions palette that holds your notions with convenience and style. The Cub Plus IV is a great stand-alone studio, but is also perfect for any suite. Place a Left or Right Cub Plus next to a StorageCenter, or next to a RollAbout with a corner top. The Cub Plus is the perfect fit for spaces of any size.